Hi friends, "BEST IITJEE PREPARATION BOOKS" welcomes you, in this post we are going to provide you a overall good quality mathematics book which has good questions, sorry as i was not to provide the whole content and theory of the chapters due to the reason it will took more time to convert the pages in pdf and it's size will too increase. Therefore we have here provided you the "QUESTIONS BOOK" which has only questions to practice. And sorry for this as a lot of topics we were not been able to provide you the whole book but will publish it in upcoming post. And the quality of these questions is too good for the beginners as well as for those who have command over the concepts. I have used this book almost around 5-6 months i found it's theory very satisfying and some of the topics such as determinants, matrices and probability in very good and easy manner. Otherwise the ncert books let me confused. Hence on the recommendation of my sir i purchased this book from amazon and worked hard. I was too weak in solving probability questions and i am sure that most of the students will surely have a lot of doubt's in probability topic so for them i prefer to use this rd sharma for once. May be you found this book helpful as i previously mentioned that this a all rounder book and you can use this for your board point of view too and help in scoring good marks in board exams also. And don't worry "why to fear when your brother is here". The first edition of this book was published in 1995, it was very well received by the readers. Without changing the basic structure of the book the subsequent revised editions were released in 2001, and 2010 etc. Which made its popularity among the readers. 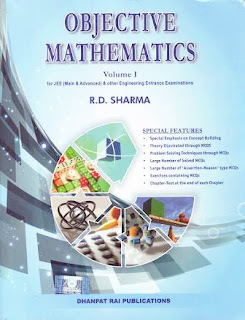 this edition is based on the suggested pattern of the JEE( mains and advanced). This book has two volumes. Vol-1 consist of 1-26 chapters covering algebra and coordinate geomtery. Vol-2 consist of 27-53 covering trignometry, calculus, vectors, 3D geometry and statistics. I am sure that you follow the book regularly and practice its question regularly then you can achieve more marks in the jee exam from the topics that comes from these particular topics. As well said"Hardwork is the key to reach success" more the hard you will work more the chances you will have to analyse and think on the problem and find the way how to solve such kind of questions in jee exam. As regular practicing enables you to tackles the tricky quesions. Also i personally suggest you to focus more on coordinate geometry because higher weightage problems are generally asked by the examiner is from this topic, moreover it will too help you when you will study 3D and vectors in your class- 12th. I have provided you guys the information about the 1st volume of this book above. Perfer this book and solve it completely two or three times, then you will be ready to tackle the tricky questions asked whether in jee mains or jee advanced. So guys that's all in this post. In next post i will post the 2nd volume of this book. If you have any query related to this book or want to suggest to post a book or any general query then please email me or comment in the comment box. I will surely try to do my best to resolve your query. Till then keep practicing regularly and lead yourself towards excellence and success. And remember the aim-IITJEE.